There are plenty of activities and events to take in when traveling to China during the winter. Depending on which part of the country you are visiting, winter weather can set in early or late in the season. If you’re in the north, with cities like Beijing and Hohhot, you may want to limit your outdoor exposure or be sure to put on plenty of cold-weather gear; all of which can be picked up inexpensively in local markets. But if you’re in the south, home of Guangzhou and Haikou, the weather can be pretty mild, albeit wet, and you’ll be able to enjoy some outdoor activities. When traveling during December, January, and February, you’ll find plenty to do and see in China during the winter. While not a Christian holiday in the country, the Chinese take pleasure in dressing up department stores, shops, and hotels with the accouterments of Christmas. If you’ll be in China and need your fix of Christmas cookies and turkey, then you’ll be able to find it, especially in a larger city like Beijing or Shanghai. This festival provides stunning winter sights in one of the coldest places in China during the winter. 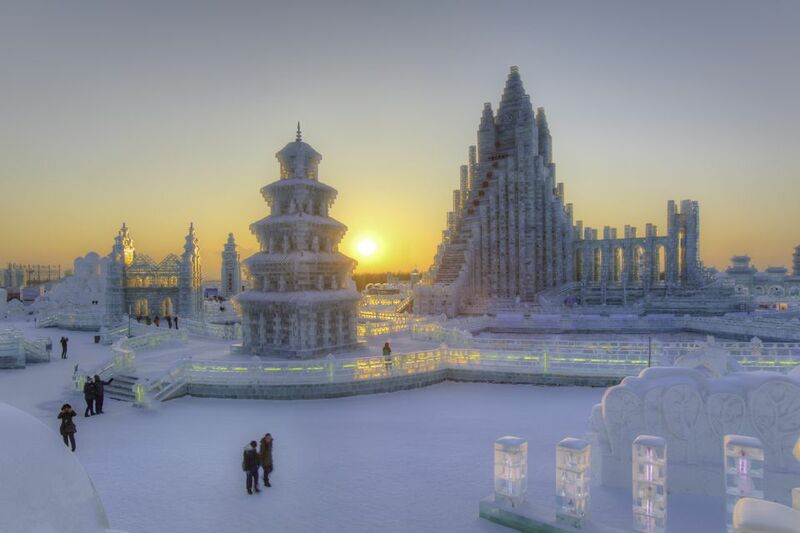 Huge sculptures made from ice and snow grace the parks and during the accompanying lantern festival, colored lights illuminate castles of ice. Hotels and restaurants are well heated so you’ll be able to escape the cold. Due to its proximity to Russia, the city has a lot of Russian influence so there is an abundance of authentic food like dark Russian bread, hot borscht, and ice cold vodka to go along with the local cuisine. Chinese New Year is the biggest holiday in China. While tourists will marvel at the decorations of Chinese lanterns, kumquat trees at every building entrance and symbols of the coming zodiac animal, the locals will head home to spend time with their families. Migrant workers will leave cities like Guangzhou, Shenzhen, and Shanghai by the millions and trains will be packed for days and days leading up to the new year. While staffing might be skeletal, hotels and many restaurants will be open, and tourist sights will be business as usual. Date: Always the final day of the New Year festival on the 15th day after the new year. This colorful event, which originated over 2000 years ago, closes out Chinese New Year holidays. The event is marked by hundreds of colorful lanterns that are best witnessed at night glowing brightly. The lanterns are each a unique work of art, built as intricate constructs that depict images of globes, fish, dragons, goats, and more. Special events are fantastic to attend but during the rest of the time, there is still much to explore in China. Skiing and other winter sports like snowboarding have increasingly become popular, and new resorts are regularly being built to accommodate these nascent ski and snow bunnies. Among the most popular options are the Beijing Nanshan International Ski Slope & Resort, which has the first snow football field, and Yabuli Ski Resort, the largest ski destination in the country. When the weather’s cold outside, head inside and eat. Part of experiencing the culture is eating the food, and most cities offer unique Chinese delicacies from each region like steaming Shanghai dumplings, Sichuan spiced hot pot, Hunanese firey rubbed pork ribs, crackling Beijing duck and more. Even in the midst of winter cold, all four sections of the Great Wall, Badaling, Mutianyu, Juyongguanm, and Jinshanling, are open to the public. Self-guided tours or tour groups are available, and the intensity level of the walk can be customized to a beginner or intermediate level. From a foot massage to full body treatment, the spas in China know how to pamper. The bathhouses and hot springs are a great way to unwind after spending time exploring, and there a variety of locations that cater to western travelers. Ask for a recommendation from your hotel. If you’re not into cold temperatures, head to China’s south where the weather is far milder. In fact, in some Chinese southern reaches, you’ll find it a better time to visit than the heat of summer. China’s winters can be wet, however, so bring rain gear. Xiamen is a beautiful city with long stretches of beach right off the coast of Taiwan. As one of China’s old foreign outposts formerly known as Amoy, it has a fascinating past to explore. Guangzhou in Guangdong Province was also a foreign outpost formerly known as Canton. It played a central role in the West’s opium trade and now serves as a factory base for China’s booming manufacturing industry. Hong Kong in winter is lovely because you can explore the area without the summer humidity weighing down on you. Macau is easily combined for a day (or two, depending on your inclination to gamble) with Hong Kong. Check out the captivating cultural center that has maintained its Portuguese heritage. Hainan is China’s largest island in the South China Sea. It enjoys very mild temperatures and while it might be too chilly to swim in the sea, you can enjoy nice walks on beautiful stretches of beach.